I have read more romance novels than I have read all the other genres combined. That itself lets you know how much I love them. Having said that, I find this genre very difficult to review, mostly because of the following reason. To me, a romance novel is like comfort food. The flavours may vary, but at the end of the day, one knows that this is no-risk soul food. In a similar way, the story in these novels could take any direction, but there is a certain comfort in knowing that there is a happily ever after waiting for us at the end. On the flip side, after a while all these stories kind of blend into one another. It takes a lot for a romance novel to stand out. Take 2 is kind of a contradiction in this respect. It has a plot that is very Bollywood (for the lack of a better word), yet this one has been a standout for me, in-spite of a familiar story line. I especially liked the well thought out supporting cast- the friends, the parents, and even a ‘villain’. They are not just added fluff, they actually play a role and take the story forward. The dialogues are laced with subtle wit and effortless charm. The characters are well fleshed out and scenes are well written. Together they create a very vivid mental picture. That is one thing that I loved about the book. It was very easy to visualise and played out like a movie in front of my eyes. With the things I mentioned above, this book already had all the ingredients of a wonderful romantic cocktail, and then the story took an unexpected but interesting turn. I won’t be able to reveal a whole lot without giving out spoilers, but there is a lot of action going on outside of the love story, which involves courtroom drama in the climax, and ultimately leads us to a befitting end. I must say that for a debut novel, Ruchi shows amazing command over her characters, scenes, and settings. It speaks volumes about her potential as a writer. 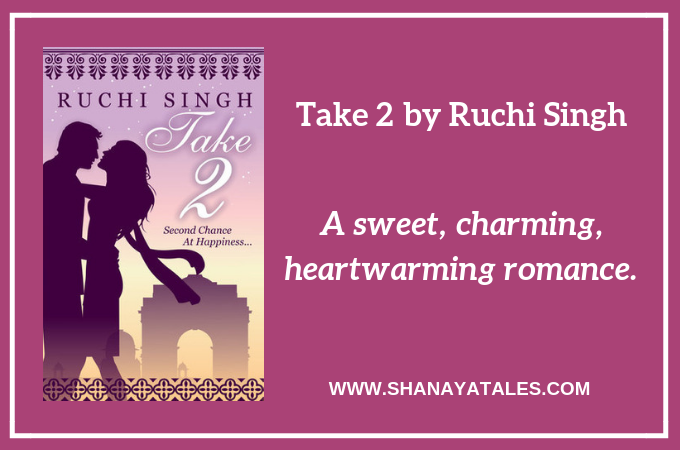 Take 2 is the kind of book that will remind you what you love about the genre of romance, and will make you fall in love with it all over again. Disclaimer: I won this book in a giveaway, and this review is written as a part of a Blog Tour conducted by The Book Club. I haven’t read this book but since I write romance, I do read a lot of it. Sometimes I just want a book that I know will be HEA when I get to the last page. Seems like a good read and nice review. Thanks for sharing! ooooo….so bollywoodish! well written!! Romance is what I thrive on too….I think I will like this one! Now i think i will go for it. Loved the storyline and I am curious as to what happened in the ending. Rajlakshmi recently posted…The Photo Addict !! I’m not much into romance, so I haven’t read this one. I tend to go for the not so happy ever after story. I’m not sure why since I could really use a bit of escape. Great to find your blog, and I enjoyed reading your review. Aww! This book has such a beautiful romance. Simply loved the characters. Agree with your review completely! I am happy that it is beyond a typical love story. I would have loved to read this, if i was into books. The way you have reviewed this is quite noteworthy…not divulging too many details and still keeping me engaged! Alok Singhal recently posted…Conversations of a different kind!